Las Vegas, NV, WPH Press, 2/12/17-Sunday crowned champions at the Las Vegas Athletic Club Central, with the Small Ball Pro Singles and Doubles, WPH Outdoor Singles and Doubles, Women’s Pro Big Ball singles, as well as age division and skill level play. 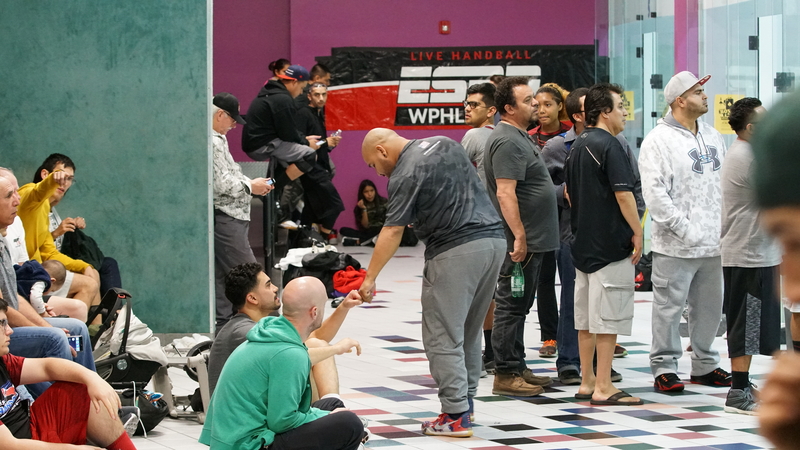 Samzon Hernandez and Timbo Gonzalez met for just the second time in a WPH Outdoor singles final, with their first finals’ encounter at the Vegas Lte 3WallBall in 2014. Both Hernandez and Gonzalez cruised to the final at the Royal Flush, with neither dropping a game en route to Sunday’s clash. 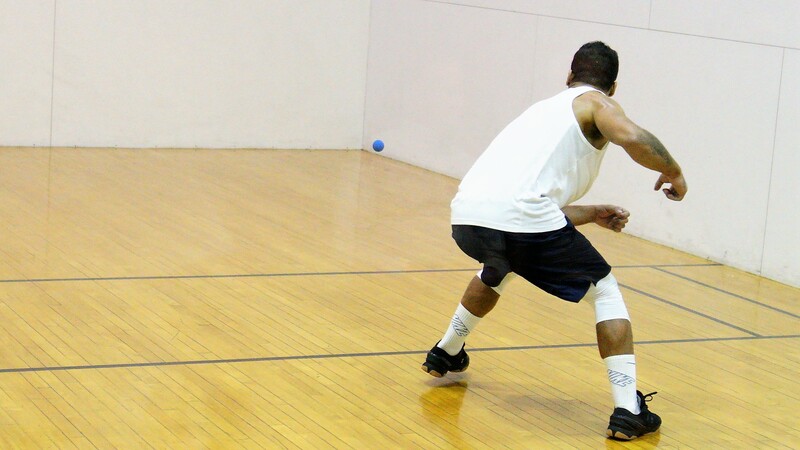 Hernandez demonstrated his 4-Wall mastery against his relatively inexperienced indoor counterpart in the final, using the ceiling and back wall to dominate the action while keeping the athletic New York superstar off-balance. Hernandez picked up his 13th WPH Outdoor singles title in two clinical games, separating himself from Juan Santos in a two-way tie with 12 WPH Outdoor titles. Deemed the “Super Team” with 25 WPH Outdoor singles titles between them, Team Hernandez/Santos faced the Cinderella team of Sal Duenas and Mauro Rojas. 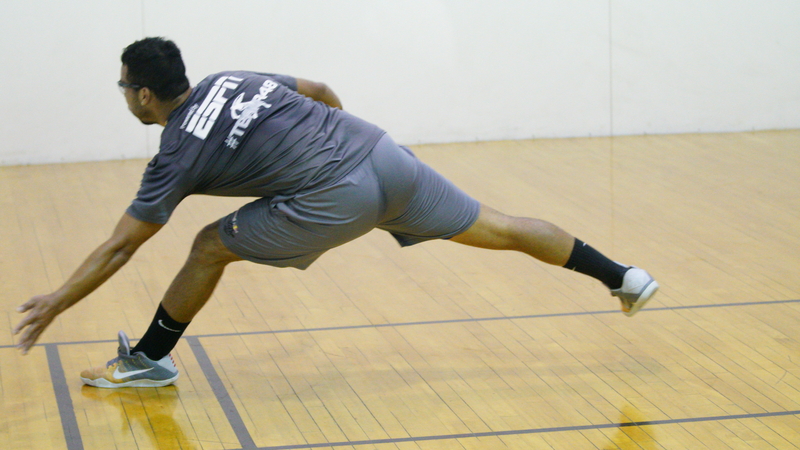 Team Duenas/Rojas stunned Team Shimbo late on Saturday night/Sunday morning, ousting the four-time WPH Outdoor double champions in an 11-8 tiebreaker. 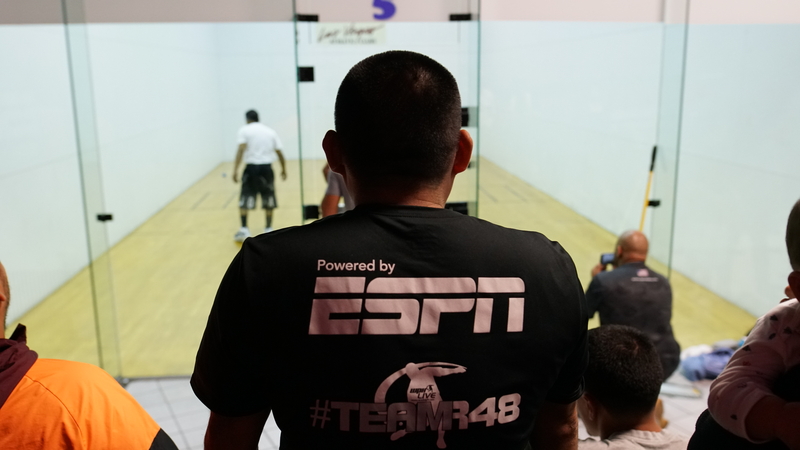 The Small Ball pro singles final featured two of the Race 4 Eight’s most prolific champions, with Sean Lenning owning five R48 titles and Moreno just picking up his tenth R48 title three weeks ago at the Plummer Bash. The blockbuster final was action-packed in game one, with both superstars firing on all cylinders. Lenning opened the match on a five-point run, scoring four of the five points on ace serves. Moreno eventually climbed into the match, executing his trademark missile kills to tie the score at 10. Lenning caught fire in the service box at 10-all, running out the game with five straight ace serves. What was quickly becoming an instant classic unfortunately ended prematurely, as Lenning crashed into the left side wall early in game two and appeared to separate his left shoulder. Unable to swing with his left and barely able to swing with his right, Lenning was forced to default just one point into the tiebreaker. 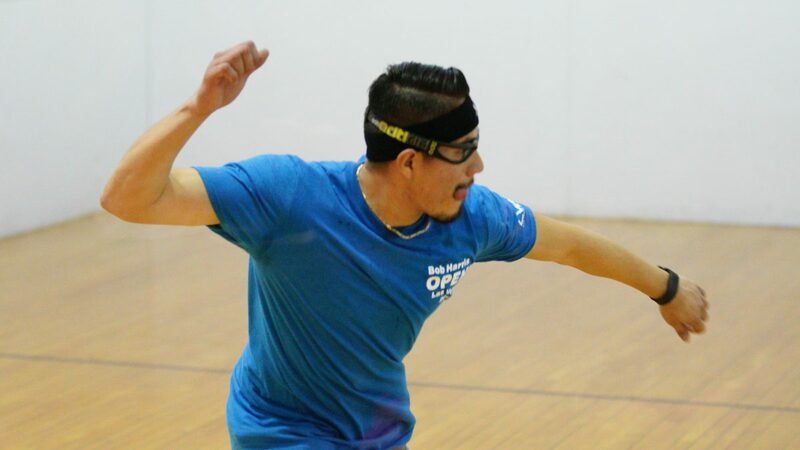 Team Perez/Cortez #TrueGrit stunned top seeded Tucsonans Luis Moreno and Abe Montijo in Saturday’s night’s semifinal, riding Perez’s hot hand and Cortez’s steady front court game to a two-game sweep. Sean Lenning and Dylan Key ousted master’s legends Team BatDog (Robles and Watkins) in two entertaining games in the bottom bracket semifinals to meet Team Portez in the final. Unfortunately, the finals could not be played on account of the left shoulder injury sustained by Sean Lenning in the singles final. 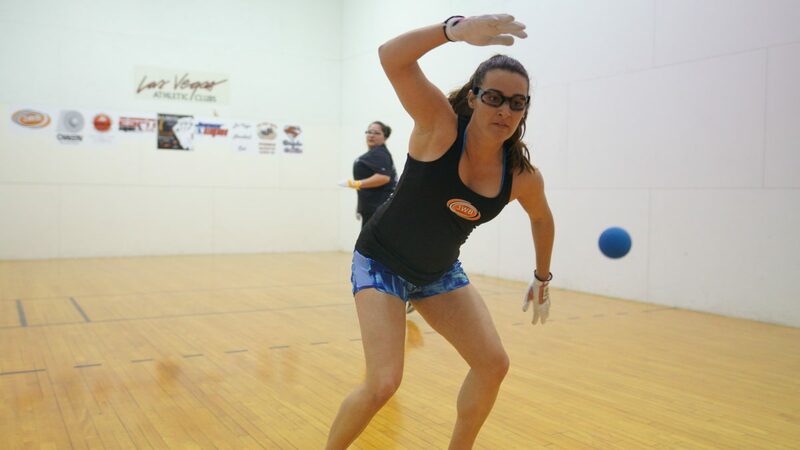 WPH 3WallBall Royal Flush co-tournament director Ashley Moler defeated WPH Outdoor Women’s superstars Karina Arias and Sabrina Zamora in the women’s round robin bracket to capture the Women’s Pro Big Ball singles title. Tucson’s Moler displayed exceptional ball control and court awareness en route to the title. Saturday night, WPH Executive Director (Dave Vincent), coupled with 3WallBall, Founder, Mike Coulter, presented Bob Harris and Family w/a special lifetime award for service. Vincent and Coulter gave speeches as local and regional crowds of fans and players gathered with family and friends to highlight the life and times of Bob Harris- a local and regional ambassador of the sport for over 40 years. “Today we honored a gentleman that has given more to handball than nearly most I’ve ever met,” said WPH Director, Dave Vincent. 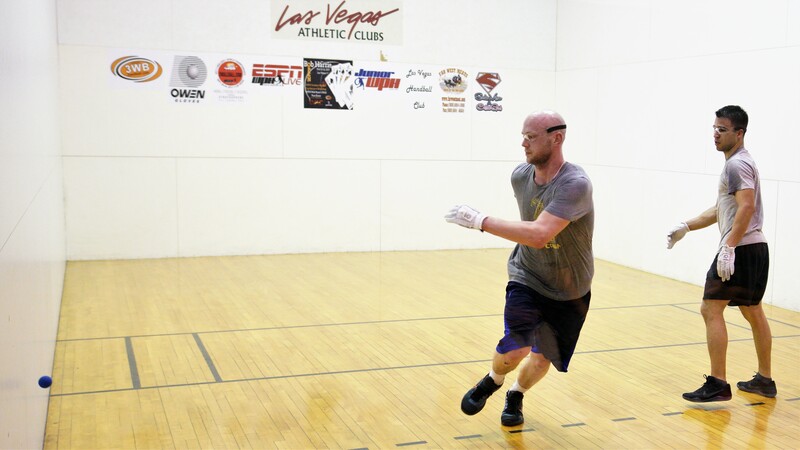 “Bob Harris has connected many people to the game and continues to bring handball new players. 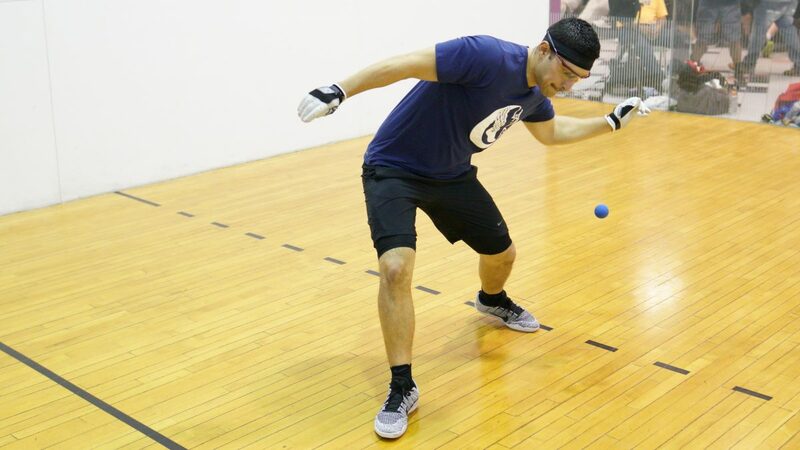 We cannot be more pleased to help breathe life into the Royal Flush Open, as we also honor a great man, Bob Harris.” WPH and 3WallBall vow to run The Bob II next year on or around the same dates. Stay tuned! 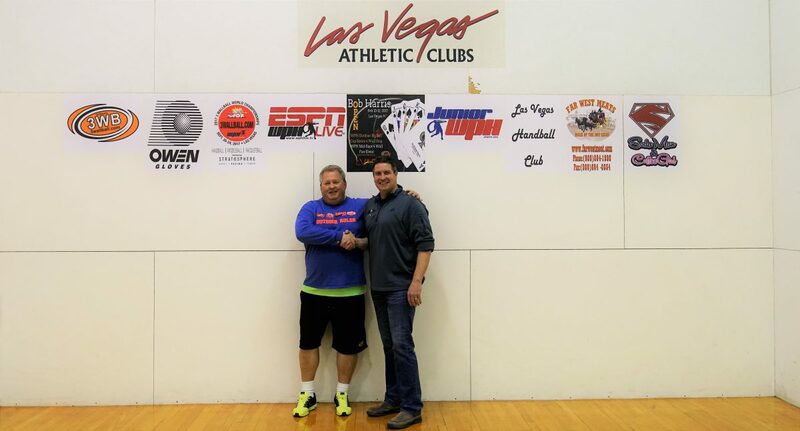 Thank you to 3WallBall tournament sponsor and host Mike Coulter, the Las Vegas Athletic Club Central, Ashley Moler and Shorty Ruiz, Bob Harris and the entire Harris family, and the WPH staff for an excellent event; Tom Flores, Javi Flores. Big nod out to Owen Gloves, Tom Kopp; Bruce Handelman and all those who made this one of the best events in WPH history. Las Vegas, NV, WPH Press, 2/11/17- The WPH’s Royal Flush featured an action-packed Saturday, with WPH Outdoor, R48 pros, and women’s pros battling for spots in Sunday’s Royal Flush finals. Saturday at the WPH Royal Flush featured the game’s best 4-Wall Big Ball stars in action, with the eight quarterfinalists aiming for a spot in the evening’s semifinals. 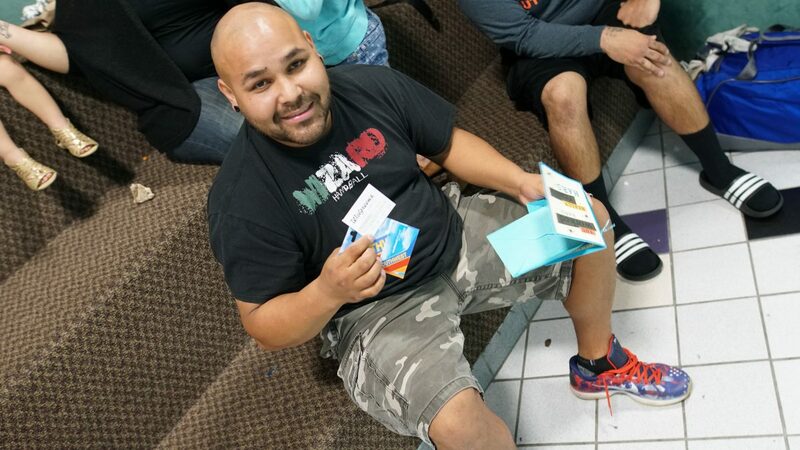 12-time WPH Outdoor singles champion and Royal Flush top seed Samzon Hernandez cruised to the semifinals, as did his east coast rival, second-seeded Timbo Gonzalez. 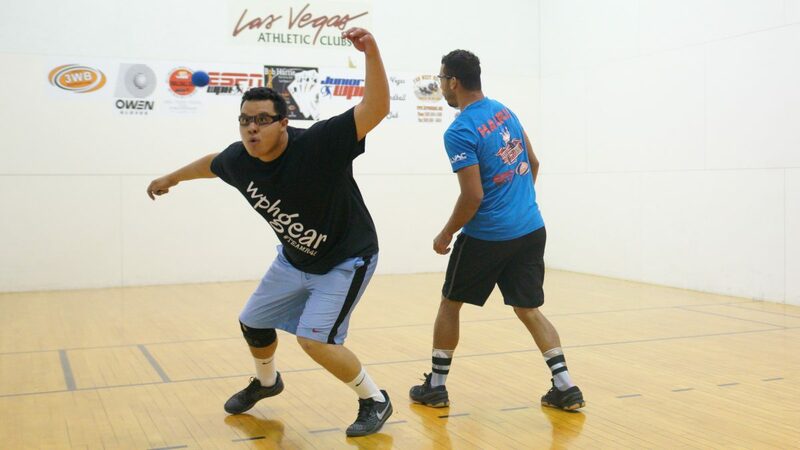 Antonio Chavez and Mauro Rojas traveled to Las Vegas together from Stockton, CA, making the 520-mile drive together to square off in one of the two upper bracket semifinals. The two friends and practice partners went the distance, with Chavez prevailing in a dramatic 11-10 tiebreaker. Six of the Race 4 Eight’s top 25 pros advanced to Saturday’s quarterfinals, with the top seeds cruising with little difficulty. Each of the four winners allowed eight points or less in the eight combined quarterfinal games. Sean Lenning started slowly against Erik Torres in the upper bracket semifinal, dropping game one, but rallied to win the next two with his trademark deep court kills and dominating serve. Luis Moreno picked up where he left off three weeks ago at the Plummer Bash, where he outscored his four opponents 120-30. Moreno has outscored his three opponents 90-19 thus far at the Royal Flush and appears to be locked in for Sunday’s final. Sunday will crown champions at the Las Vegas Athletic Club Central, with the Small Ball Pro Singles and Doubles, WPH Outdoor Singles and Doubles, Women’s Pro Big Ball singles, as well as age division and skill level play. 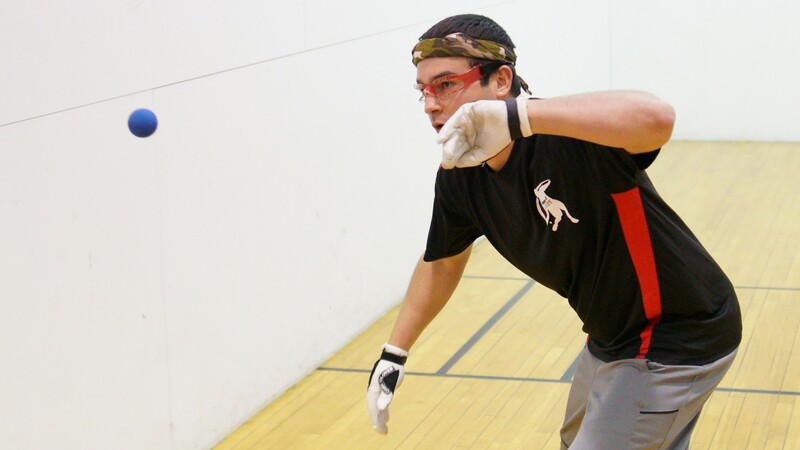 Men’s semifinals featured Sean Lenning and Dylan Key vs John Robles and partner Chris Watkins; meanwhile, the team of Luis Moreno and Abraham Montijo faced up with Vic Perez and John Wayne Cortez. In the upper bracket, JWC /Perez got past the #1 seeds (Moreno/Montijo) 15-9, 15-8 and Dylan Key/Sean Lenning sneaked past Robles/Watkins 15-11, 15-5. 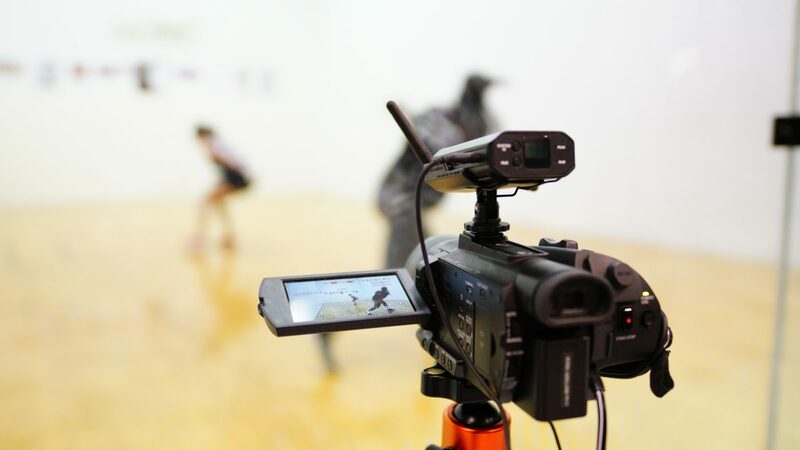 Stay tuned to this thread, the World Players of Handball on Facebook, #TeamR48 on Facebook, and @WPH and @DFWPH on Twitter for updates throughout the weekend. 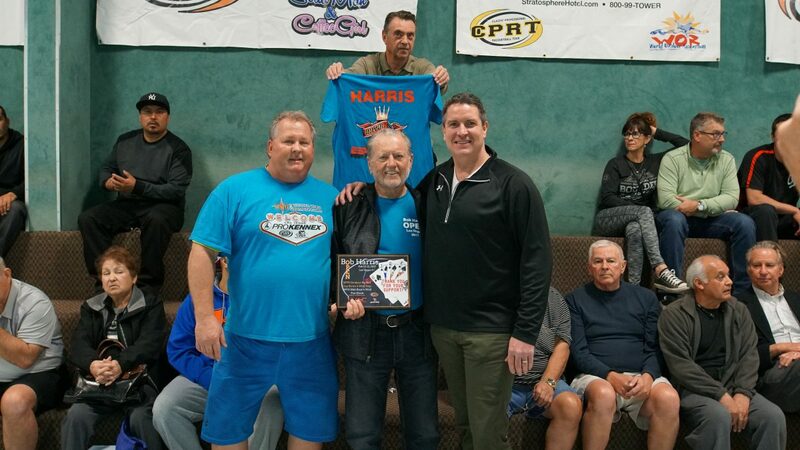 Las Vegas, NV, WPH Press, 2/10/17- The WPH’s Royal Flush kicked off on Friday, with more than 160 players paying tribute to local Las Vegas legend Bob Harris. The WPH Outdoor 6 season kicked off its second event of 2017 with 4-Wall Big Ball singles and doubles in Sin City. Juan Santos’ bid for his fifth WPH Outdoor Player’s Cup title started ominously at the WPH Outdoor 6 opener, as Santos fell in the quarterfinals of the singles and semifinals in doubles. Santos will need strong showings in both the singles and doubles at the Royal Flush to climb back into his customary top spot. 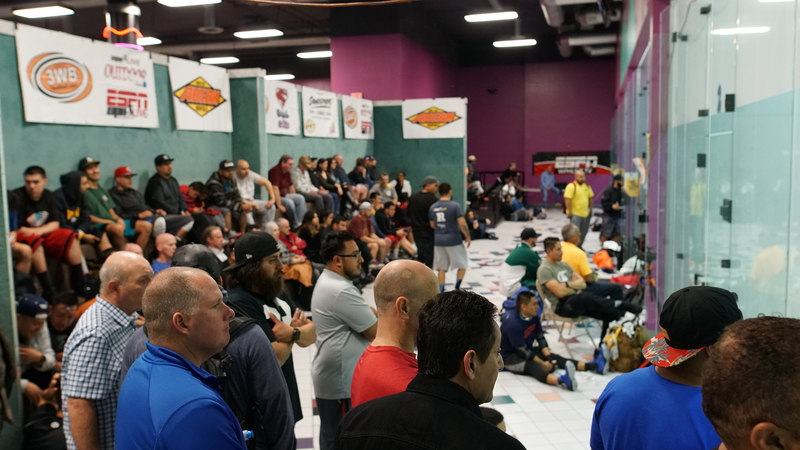 Samzon Hernandez, Timbo Gonzalez, and Shorty Ruiz are also gunning for the top spot in Vegas, making the season’s second stop a pivotal one. 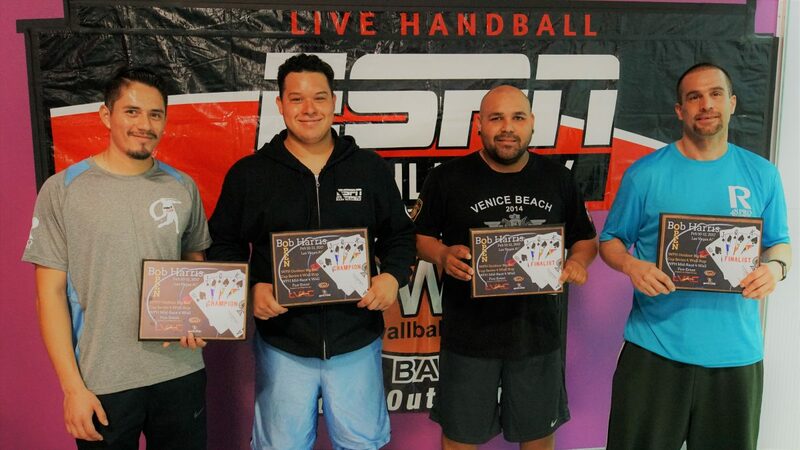 Top seeds Samzon Hernandez, Timbo Gonzalez, and Juan Santos survived close opening round matches at the Royal Flush to advance to Saturday’s quarterfinals. Antonio Chavez stunned fourth-seeded cross over star Shorty Ruiz, Stockton’s Mauro Rojas defeated former WPH Outdoor singles champion Lobo Valencia, Chris Tojin came back to defeat Sal Duenas in his 32nd consecutive WPH Outdoor start, and Chava Cordova cruised past Manuel Chavez. Deemed as the mid-season Race 4 Eight All-Star break, six of the Race 4 Eight’s top 25 pros converged in Las Vegas to compete for the prestigious Royal Flush title. Five of the six R48 pros advanced comfortably on Friday night, while John Wayne Cortez #TrueGrit shocked R48 #20 Abraham Montijo in a 15-10 tiebreaker. “I just kept pushing,” exclaimed Cortez. “I didn’t want to let the tiebreaker slip away like I did the first game.” George Garcia, Jr. and Dylan Hernandez rounded Friday’s round of 16 winners. 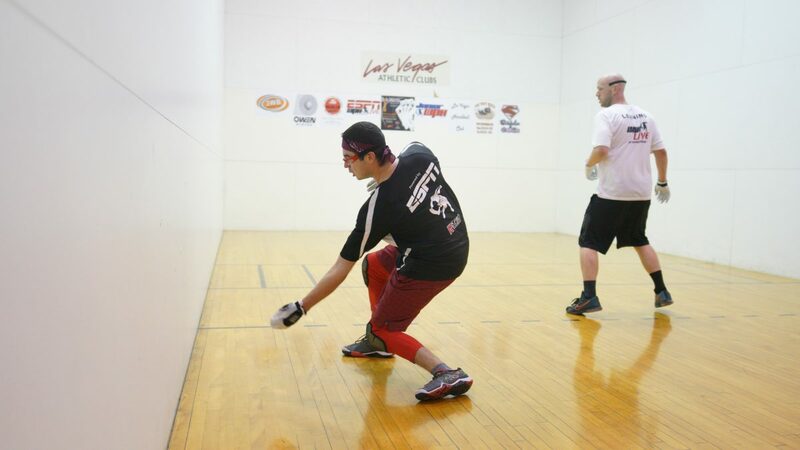 Saturday will be jammed packed at the Las Vegas Athletic Club Central, with Men’s Small Ball Pro Singles and Doubles, WPH Outdoor Singles and Doubles, Women’s pro Big Ball Singles, and age division and skill level play.